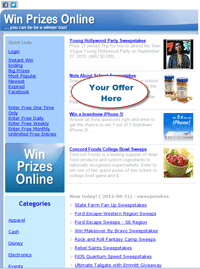 Promote Your Offer with us to get more exposure! Increase site traffic. Improve visibility. 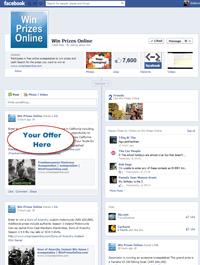 Take advantage of the Win Prizes Online community to boost not just your offer but your entire website. 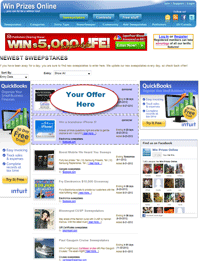 - Win Prizes Online gets millions of page views each month! - Our visitors average more than fifteen minutes on-site per visit; that's time spent looking at your advertisement! - More than a quarter of our visitors look at 20+ pages per visit. Your adcould be on each of those pages!